Recommended citation: Litscher G. Auricular Medicine. OBM ICM 2017;2(4):004; doi:10.21926/obm.icm.1704004. The treatment by auricular therapy has a long history. Ear acupoint research has been advancing step by step worldwide [1-17] . The introduction of lasers into medicine brought besides the already existing stimulation with needles, electricity, pressure and liquids an additional technique to auricular acupuncture. The RAC (Reflex Auriculo-Cardiac) represents an important scientific method in the field of auricular medicine. At the TCM Research Center of the Medical University of Graz, new methodological strategies for recording and objectifying the dynamic pulse changes were scientifically investigated and described. With high-resolution imaging of pulsatile surface changes, the RAC can be reproducibly quantified for the first time. One of the methods consists of a combination of an innovative microscope system of the Medical University of Graz, a video software analysis and special image processing programs of the Beijing University of Science and Technology. First test measurements document the realization of the new method approach (Figure 1 and 2). Figure 1 Quantification of the RAC (modified from ). Figure 2 Proof of the dynamic changes in the laboratory using alterations at the surface (modified from ). Sino-European transcontinental basic and clinical high-tech auricular acupuncture studies demonstrate the modernization of auricular acupuncture and the scientific way from auricular therapy to auricular medicine (Figure 3). Auricular medicine has come of age and has gained the attention of the wider medical community in recent years. The studies were supported by the Austrian Ministry of Science, Research and Economy (BMWFW) and the German Academy of Acupuncture (DAA). Gao XY, Liu K, Zhu B, Litscher G. Sino-European transcontinental basic and clinical high- tech acupuncture studies-part 1: auricular acupuncture increases heart rate variability in anesthetized rats. Evidence-Based Complementray and Alternative Medicine,2012;2012:817378. Gao XY, Wang L, Ingrid G, Yvonne M, Zhu B, Gerhard L. Brain-Modulated Effects of Auricular Acupressure on the Regulation of Autonomic Function in Healthy Volunteers. Evidence-Based Complementray and Alternative Medicine, 2011;2012:714391. Xian S, Litscher G, Wang H, Lu W, Zhao Z, Litscher D, et al. 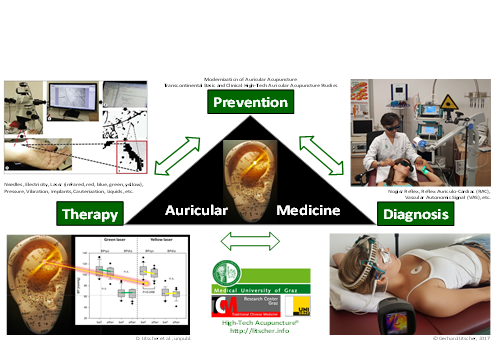 Continuous Auricular Electroacupuncture Can Significantly Improve Heart Rate Variability and Clinical Scores in Patients with Depression: First Results from a Transcontinental Study. Evidence-Based Complementray and Alternative Medicine, 2013;2013:894096.